Since watching Knight Rider as a kid I’ve wanted to chat with my car, Elite: Dangerous fans have skipped that generation of vehicle and let you talk to your spaceship. 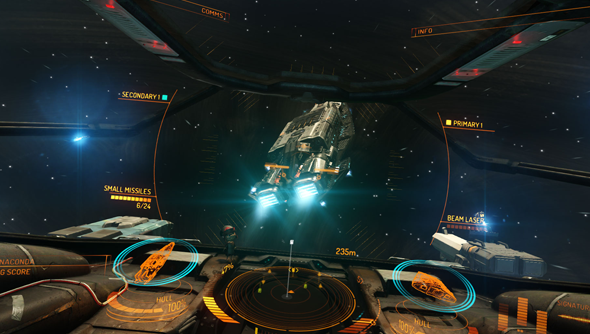 The Elite: Dangerous Voice Pack loads your ship with an AI entity called ASTRA who you can instruct with voice commands. Primarily she can fly your ship but she also has a pretty big database that you can query at any time, the GalaXapediA. ASTRA, an Artificial Speech Text Response Application, can be instructed to do things like increase and decrease speed in increments, raise landing gear, kick in your afterburners and a stack more. You’ll need to direct the ship yourself but system control can be handled largely by ASTRA. Nothing will make you feel more like being a space captain like shouting “Unlock targets. Main drive 50%. Full power to shields” in the thick of combat. If that’s not enough then you can map new commands to the system, too. I hope a future release will let me pull a 180 when I call for a Crazy Ivan. More than commanding your ship, ASTRA has an extensive database called the GalaXapediA that you can access with questions like “What is a dwarf star?”, “What is an event horizon?”, and “What is a wormhole?”. While currently the GalaXapediA is only filled with actual scientific terms the team who made this are working on a database of sci-fi terms. Everything from Star Trek to Hitchhiker’s Guide to the Galaxy. The Elite: Dangerous Voice Pack is on sale for £3.50 from the company’s site but, in addition to the pack, you’ll need a software called Voice Attack. It comes with a three week trial so you can try it out for a fair while before buying. Another software taht lets you command your ship with your voice is Glovepie, which is free. Though the makers don’t say whether you could load ASTRA into it. The team are planning on working on adding terms and commands for the long haul. they’ll also take requests of additions so if this is something you like then it’s worth having a read through the voice pack’s site.